Why? Well, for one, because I’m abroad, and can’t benefit from the bank holiday that the rest of the UK sees. I have revision to do and a life to lead. The other reason is that, like the majority of Briton’s… I don’t care. Why should I celebrate the wedding of a socially distant monarch-to-be, and his bride. I can vaguely relate to him as “my” Prince, and to her as a fellow “commoner” but admit it – these ties are tenuous for the majority. Like most people in the UK, the machinations of the monarchy don’t impress me, nor can I see a particular reason to do away with them. But some people do see reasons – 18% of Brits are Republican, according to a recent Ipsos Mori poll, and thus favour abolishing the monarchy. Reasons may include the fact that the monarch still wields huge power and many, correctly, believe this has no real place in a democracy. Royals may bring in tourist revenue, but they also cost us hugely from the public coffers – this wedding as a shining example of the cost of the monarchy. I don’t recall anyone paying for a politician’s wedding. A lot of power is also still concentrated with the monarchy – even look at Prince Andrew bring given the role of UK Special Representative for International Trade and Investment, back in 2001. I have yet to see qualifications. Personally, I think that the democratic, progressive reformists have bigger things to worry about. House of Lords reform, and finally getting a Constitution are paramount. The monarchy can be left alone, for now. I do believe that the provide a strong system of checks and balances against the power of parliament – everytime I think that we should do away with the monarchy, I remind myself … President Blair. But, eventually the time must come when they must step aside, and allow Britian to develop into one of the world’s true democracies. Having said that I will be very interested to here what the Alliance of European Republican Movements has to say at their convention on the 30th of April, one day after the Royal wedding. Watch this space. Oh, by the way. Returning to that bank holiday… if people weren’t grateful for a day off work, I wonder how many more of us would be in favour of scrapping the Monarchy…just think about it for a second. Interesting stuff – but 18% isn’t very many is it? Aren’t Prince Andrews qualifications in the fact that his royal status gives him an edge when forging new deals that others don’t have? I’d also say that a remarkable number of republics were downgraded from ‘full democracy’ to ‘lapsed democracy’ status by the Democracy Index, whilst all western European monarchies remained in the top ten. 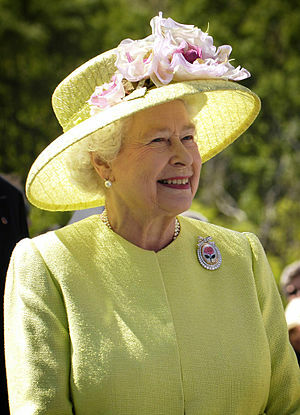 Also you have to admit – that jacket on the queen really matches her teeth…. In fairness, it’s not exactly a majority – though to be perfectly honest, it’s far higher than I expected. It’s also at great odds with the fact that more than 95% of our MPs are from effectively monarchist parties – Conservatives (naturally), Labour and Liberal Democrats (no official aims to abolish the monarchy, though I will acknowledge some individual MPs may, Tony Benn as a good example). I’m aware of your article (I read it with great interest) but I don’t see that, necessarily, the reason for Britain’s lack of corruption, and for other democracies’ widespread corruption, is that we have a monarchy and they do not. They do seem to have a form of feudalistic patronage, but… then it could be argued that the nepotism and corruption we see in, say, Italy, could be comparable to Prince Andrew’s appointment. I concede, not on the same scale, but a comparison can be drawn. The fact that there is no duty and accountability in Russia, Italy, or Greece, may not stem from a lack of monarchy, and there are other ways to impose such a regime. I don’t think Finland, from what I know, is particularly corrupt, nor are Iceland, Ireland or Switzerland , nor really are France or Germany (Chirac aside, and perhaps a couple of others). No state is entirely without corruption. I don’t see that as a necessary link, and I believe that that accountability could be put in place by non-monarchial systems in a Republic. But I do agree – the lady has class. « Scotland’s Scary System…and Wales, and Northern Ireland….